No new projects other than what is already funded and scheduled to be in operation through 2040. Lower-cost street improvements such as minor intersection widenings, street restriping, bus operations enhancements, signal prioritization, optimization and synchronization. Metro and the Federal Transit Administration (FTA), in coordination with the cities of Los Angeles and San Fernando, are evaluating the feasibility of a major mass transit project that would operate in the center or curb-lane of Van Nuys Boulevard from the Van Nuys Metro Orange Line, north to San Fernando Road. From there, the proposed alignment would proceed northwest on or adjacent to San Fernando Road to the Sylmar/San Fernando Metrolink station – a distance of 9.2 miles. 1. What is the process for studying this project? The East San Fernando Valley Transit Corridor must go through an environmental review process consistent with federal and state guidelines. The process began with the completion of an Alternatives Analysis (AA) Report (a report that considered all feasible alternatives for the corridor) and continued with the refinement of the alternatives and the preparation of a Draft Environmental Impact Statement/Environmental Impact Report (Draft EIS/EIR). In 2016, Metro submitted the Administrative DEIS to the FTA for review and Authorization to Circulate. Now that the Draft EIS/EIR has been approved by the FTA, the document will be circulated for a 45-day public review and comment period. During this period, Metro will hold public hearings on the document throughout the corridor to present its findings and to request input from those that may benefit or be impacted by the project. After conclusion of the public comment period, the Metro Board of Directors will be asked to select a Locally Preferred Alternative (LPA). After the LPA is selected, Metro will prepare the Final EIS/EIR. This document will address all public comments received during the project’s 45-day review period. The Metro Board will then be asked to certify the EIR (the State environmental document), and it becomes final. The federal environmental review process concludes when the FTA grants the project a Record of Decision (ROD). 2. How was the study area determined? Initially, an alignment along Van Nuys Boulevard and Sepulveda Boulevard (as well as several hybrids of both) were considered as these two Boulevards realize the greatest north/south transit ridership and the greatest congestion in the San Fernando Valley. After completing a technical review and after considering hundreds of community comments (most expressing a preference for service on Van Nuys Boulevard), it was determined that the Project should focus on Van Nuys Boulevard. In addition to the Boulevard being the busiest north-south transit corridor in the San Fernando Valley, it includes the Civic Center and other primary origin/destination points including the Van Nuys Metrolink station. Also based on community comments and a technical review, the northern origination/terminus of the Corridor was changed from Van Nuys Boulevard and the Interstate-210 Freeway, to the Sylmar/San Fernando Metrolink Station. This location is serviced by a number of local and rapid buses and provides a connection to regional commuter rail service that connects with Santa Clarita and the Antelope Valley communities. 3. How were the build alternatives developed? 4. What are the refined alternatives being studied now? 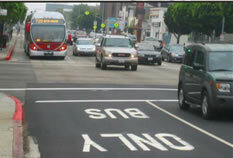 Alternative 1: Curb-Running Bus Rapid Transit (BRT) Similar to the Wilshire BRT service, high-capacity, clean- fuel/Compressed Natural Gas (CNG) buses would operate in dedicated “bus only” lanes, running along the curb for 6.7 miles on Van Nuys Boulevard and for 2.5 miles in mixed-flow lanes along San Fernando Road and Truman Street. The alternative would include 18 enhanced stations. Similar to the Metro Orange Line, high-capacity, clean-fuel/ Compressed Natural Gas (CNG) buses would operate in a 6.7 mile dedicated median busway in the center of Van Nuys Boulevard and 2.5 miles of mixed flow operations along San Fernando Road and Truman Street, and would include 17 enhanced stations. Similar to surface-running rail systems in San Diego, San Francisco, and Portland, low-floor, electric-powered rail vehicles would operate in a dedicated guideway in the center of Van Nuys Boulevard for 6.7 miles and 2.5 miles mixed-flow lanes along San Fernando Road with 28 enhanced stations. Similar to the existing Metro Blue, Green, Gold, and Expo Lines, overhead electric-powered rail vehicles would operate on a dedicated guideway in the middle of Van Nuys Boulevard, with 2.5 miles underground between Sherman Way and Roscoe. The trains would operate for 2.5 miles on railroad right-of-way, adjacent to San Fernando Road. 5. How much does each build alternative cost? Currently, all costs are preliminary capital costs in 2014 dollars and are subject to change. After the Metro Board selects the LPA, the project will move into its preliminary engineering phase where with more detailed drawings, Metro will be able to complete more detailed cost estimates. 6. How much money is available for the Project and what are the funding sources? In November 2016, the voters of L.A. County approved Measure M, a ½ cent sales tax designed to make funds available for several transit and highway projects. Measure M earmarks $1.3 billion for the East San Fernando Valley Transit Corridor, which is sufficient to build either an at-grade Light Rail Transit or Bus Rapid Transit project for the 9.2-mile corridor. 7. What other alternatives are being evaluated? No B uild: This looks at the study area in 2040 without any new project. It incorporates existing roads; highways; transit services and facilities, as well as any other future projects that are included in the Metro Board adopted 2009 Long Range Transportation Plan for implementation by 2040. Transportation Systems Management (TSM): This option considers low-cost capital and operations improvements to the transportation system such as improvements to signal timing, enhancing existing bus service, widening targeted intersections, etc. 8. What factors will be used to evaluate the various alternatives for this project? 9. What are some of the existing conditions of the Study Area, specifically Van Nuys Boulevard? Buses operating on Van Nuys Boulevard realize approximately 25,000 daily/weekday boardings. The Corridor has more transit-dependency, more zero-vehicles households, and greater poverty than Los Angeles County averages. Of the transit trips, 50% stay within the Corridor. 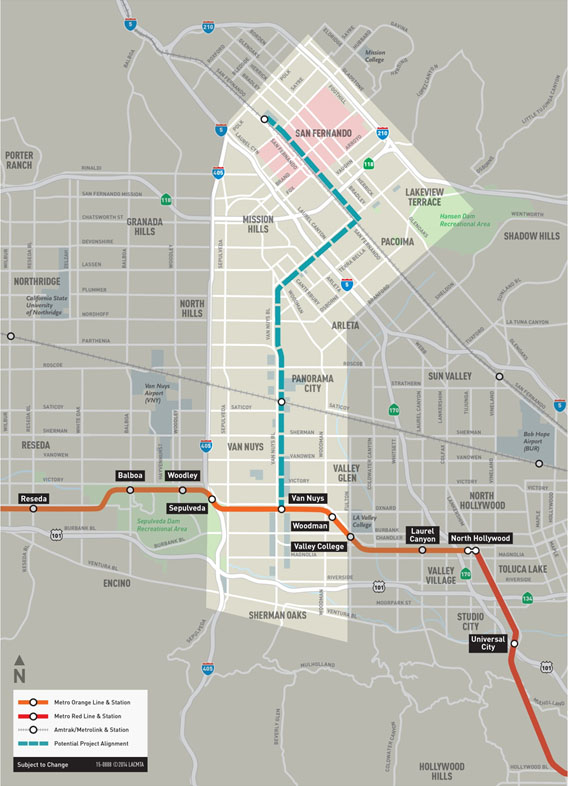 More than half of the boardings within the Study Area occur within the three-mile segment between the Metro Orange Line to the south and the Panorama City Mall to the north. In the congested segments of the Corridor, bus speeds drop to as low as 10 mph during the afternoon peak- periods (3 to 6pm). The Corridor has the 7th highest transit boardings in the entire Metro system. The Corridor has the highest north-south transit boardings in the San Fernando Valley. 10. How will the proposed East San Fernando Valley Transit Corridor Project improve transit connections to the entire region? With the passage of Measure M, Metro is transforming transportation across the region, and the East San Fernando Valley Transit Corridor Project is one of 40 major transit and highway projects planned for the next 40 years. Planners for this Project will continue to work together with planners for other San Fernando Valley transit projects with Measure M funding, including the Sepulveda Transit Corridor Project, Metro Orange Line BRT Improvements, and the North San Fernando Valley BRT Improvements Project. The East San Fernando Valley Transit Corridor also connects with the Van Nuys Metrolink and Amtrak station and the Sylmar/San Fernando Metrolink Station, providing linkages to regional destinations. 11. Is Metro working with other agencies on the East San Fernando Valley Transit Corridor Project? As part of its planning process, Metro is collaborating with the City of Los Angeles, the City of San Fernando, and Metrolink. Any future Metro project must take into consideration City of Los Angeles plans; potential projects planned by the City of San Fernando; the Metrolink Van Nuys North Platform Project and the proposed Metrolink safety improvements Brighton to Roxford Double Track Project. 12. Is Metro studying Active Transportation needs for the Corridor? 13. Will a new storage and maintenance facility be needed? If a Bus Rapid Transit (BRT) project is selected as the preferred alternative, the service would be supported with Metro’s existing bus maintenance facilities though they may need some minor modifications like additional bus-washing bays. If a Light Rail Transit (LRT) alternative becomes the preferred alternative, a new facility would be needed to store and maintain the rail cars. Three candidate locations have been identified for a rail yard, all three of which are to the west of Van Nuys Boulevard. The first is south and north of the Metro Orange Line. The other two are adjacent to the rail tracks that are just north of Saticoy. The first is to the immediate south of the tracks, and the second is to its immediate north. The candidate rail yards are located within a ¼-mile of the route (Van Nuys Boulevard) in an area zoned for industrial use, and are approximately 25 to 30 acres in size. 14. How will public input be reflected in the study? Public input is a critical element of the planning process and has already influenced the study. Metro has hosted numerous community meetings to update residents, businesses, elected officials and stakeholders on the study’s progress. Based on comments received at earlier stages, the project has evaluated different travel modes, routes and origin/destination points. Public input will continue to be one of the factors used to analyze the alternatives being evaluated for this project. All feedback received will be summarized, documented and shared with the Metro Board of Directors. While public input is gathered throughout the study effort, there are two “formal” public comment periods. Scoping Meetings: The work on the Draft EIS/EIR began with a “scoping period” from March 1 through May 6, 2013. During this time, the public was invited to provide input on the issues they suggested the study analyze. Public comments were received in person during scoping meetings and in writing. Public Hearings: Prior to consideration and action by the Metro Board of Directors, the Draft EIS/EIR will be released for a 45-day public review period. This is the time when the public can submit “official” comments and questions for further consideration by the Metro Board as it considers its selection of the Locally Preferred Alternative and for additional analysis during development of the Final EIS/EIR. Comments and questions may be submitted in writing either at public hearings or to Metro prior to the end of the 45-day public comment period. 15. Wasn’t the curb-running BRT alternative previously eliminated during the AA process? Why is it being reconsidered? The Alternative is being reconsidered as it could have the least impact on existing traffic and has the potential to be constructed within the budget reserved for this project in the 2009 Long Range Transportation Plan. 16. What are the routes and characteristics being evaluated for the Low-floor Tram alternative in the Draft EIS/EIR? The Low-floor Tram alternative is proposed to run in the middle of Van Nuys Bl between the Metro Orange Line and San Fernando Rd. To the north, the Tram is proposed to operate in mixed flow lanes along San Fernando Rd, between Van Nuys Bl and the Sylmar/San Fernando Metrolink Station. It would operate at prevailing traffic speeds, controlled by traffic lights. To the south, Tram service could connect with the future Sepulveda Transit Corridor project once decisions are made about that project’s alignment, budget, and delivery schedule. This alternative would be similar to surface-running rail systems in other cities such as the San Diego Trolley, San Francisco Muni and Portland MAX. It could also mimic modern tram systems that are being implemented in European cities and other parts of the world. Stations could be constructed at approximately half-mile intervals. 17. Why are you evaluating a low-floor tram system? This mode was not specifically included in the AA Study as it was presumed that the rail alternative would be modeled on the standard Los Angeles LRT lines already in operation. We are now considering this new mode (which is similar to LRT) as it would have much higher carrying capacity than a BRT system, while avoiding some of the grade separation and right-of-way impacts that would be required with the standard Los Angeles LRT alternative. 18. What are the routes and characteristics being evaluated for the high-floor Light Rail Transit alternative in the Draft EIS/EIR? The LRT would operate in fully-dedicated right-of-way along Van Nuys Bl and in the Metro-owned right-of-way that runs along San Fernando Rd, with signal priority for a distance of 9.2 miles. Depending on the location along the route, it would operate on the street or below ground. Metro Local bus service would continue to operate, thereby continuing to provide service to less traveled intersections along Van Nuys Bl. This alternative would connect to feeder bus service between the Metro Orange Line and Ventura Bl. Stations could be constructed at approximately one-mile intervals. A new rail maintenance facility would be required within a ¼ mile of the alignment, for which several industrial locations are being evaluated. 19. What is meant by low-floor versus high-floor vehicles? The terms refer to the height of the entrance to each rail vehicle. The low-floor vehicle can be boarded at curb-level whereas with a high-floor vehicle, boarding is at a raised level (approximately three feet in height) requiring the use of a station platform to come up to the vehicles’ entrance. 20. What other alternatives are being evaluated? No Build: This looks at the study area in 2040 without any new project. It incorporates existing roads; highways; transit services and facilities, as well as any other future projects that are included in the Metro Board adopted 2009 Long Range Transportation Plan for implementation by 2040. 21. How is a Tram different from a Light-Rail Transit vehicle? How are they different from a Streetcar, an option that had been eliminated earlier? Low-floor Tram, Light Rail Transit, and Streetcar are all different types of rail vehicles that are in common use throughout the world. The terms may be used somewhat differently in other areas of the United States. Here in Los Angeles, we have generally used the term “streetcar” to refer to smaller, one-car rail vehicle that operates at street-level, in a confined area, in mixed flow traffic, as a circulator. Operate at street-level, above or below-ground, with the tracks in their own right-of-way. Light rail cars in Los Angeles use high platform stations that must be constructed in the middle of the street or railroad right of way. Operate at street-level, above or below ground, within the tracks in their own right-of-way or in mixed flow traffic. Stations would be approximately at existing sidewalk levels so that normal sidewalks could be used for stations instead of the high platform required for light rail. 22. How is each powered? Bus Rapid Transit vehicles are powered by clean-fuel Compressed Natural Gas. Light Rail Transit and Tram vehicles are powered by electricity from overhead lines. 23. How much money is available for the Project and what are the funding sources? $170.1 million has been identified for this project in Metro’s 2009 Long Range Transportation Plan (LRTP). These funds come primarily from the State of California’s Traffic Congestion Relief Program (TCRP) and Measure R, the ½-cent sales tax approved by Los Angeles County voters in 2008. 24. How much does each build alternative cost? These estimates will be further refined as the study continues. Please note, however, that only $170 million has been identified to build this project. 25. Why is there such a wide variation in the cost numbers? Rail options such as LRT and Tram are generally more expensive due to the costs associated with constructing tracks and electrical power along the line to power the trains. Costs would also be incurred to acquire land and build the required rail maintenance and storage facility. On the other hand, existing Metro bus maintenance facilities in the San Fernando Valley could support the BRT options. The cost ranges for each travel mode can also vary due to the differences in the number of stations, forecasted property acquisition needs, grade separations, etc. The cost projections will be refined further as the study continue. 26. The alternatives all seem to cost more than $170.1 million. How are you going to build the project if you don’t have the money? Like all of the other Measure R transit projects, the East San Fernando Valley Transit Corridor will likely need to seek additional funding to be able to be built in full. The project may also be built in phases to match available funding. These options will all be evaluated as the study progresses. As the details of the project become better defined, additional funding sources may be identified. 27. How will the proposed East San Fernando Valley Transit Corridor Project improve transit connections to the entire region? The East San Fernando Valley Transit Corridor intersects with the Metro Orange Line that connects to the Metro Red Line in North Hollywood. It also connects with Metrolink and Amtrak stations providing linkages to regional destinations. 28. Is Metro determining where the greatest number of people need to – or want to – travel? Yes, one aspect of the analysis will be to determine travel patterns in the study area, including travel to key destinations within the corridor and beyond. Community input from individuals and organizations will provide important information about key destinations. The study will also complete a “trip distribution analysis” to better understand travel characteristics within the study area. 29. How will the proposed East San Fernando Valley Transit Corridor Project work with the Sepulveda Transit Corridor Project? The Sepulveda Transit Corridor Project is another one of the Measure R transit projects. This future project is intended to improve connections between the San Fernando Valley and the Westside of Los Angeles. Based on the current funding schedule in Metro’s 2009 Long Range Transportation Plan (LRTP), the Sepulveda Transit Corridor Project is not planned to be in operation until 2039. However, Metro is exploring alternate funding scenarios, including Public-Private Partnership, which may allow a project to be completed sooner. It is not yet known what kind of project this future improvement would be. Options range from BRT in High Occupancy Vehicle/Express Lanes along the I-405 Freeway to a full transit/highway tunnel extending under the Pass from the Metro Orange Line to the future Metro Purple Line and/or Metro Expo Line Stations in West Los Angeles. Regardless, planners for the East San Fernando Valley Transit Corridor and the Sepulveda Transit Corridor Project are working together to ensure coordination between the two projects. 30. Will the East San Fernando Valley Transit Corridor Project look at connections into Downtown Burbank? No. In Metro’s 2009 Long Range Transportation Plan (LRTP), the East San Fernando Valley Transit Corridor is focused on improving north-south travel. A connection further east to Burbank is being studied separately as a potential Bus Rapid Transit project as approved by the Metro Board of Directors on July 24, 2014. 31. How will the East San Fernando Valley Transit Corridor Project work with the proposed California High Speed Rail Project? Metro and the California High-Speed Rail Authority are working closely together. The East San Fernando Transit Corridor Project must consider the future development of the railroad right-of-way that extends from Van Nuys Bl to the Sylmar/San Fernando Metrolink Station. This route is being considered for future High Speed Rail service that will connect Downtown Los Angeles with San Francisco in less than three hours. 32. Will bike lanes and other bike facilities be included along the Corridor as part of this project? As a part of the environmental study, opportunities to integrate shared bike facilities are being evaluated due to the limited width size of current streets. 33. How will the location of stops or stations be determined? Several factors are considered when determining station locations. Depending on the type of project, stations are typically located 1/2- mile to one mile apart. The goal is to improve overall travel time by allowing for greater speeds between stations, and less time stopped at stations, while also maximizing ridership potential by locating stations to allow for easy transfers to other bus lines and to serve highly visited destinations and activity centers. 34. Will on-street parking be affected? Some of the options being evaluated would impact on-street parking in areas; however, it is too early in the process to identify specific locations or impacts. Parking impacts are being evaluated in the environmental study. 35. Will corridor businesses be affected? Similar to the previous answer on parking, it is too early in the process to identify the effects, if any, that the project will have on businesses. The EIS/EIR will analyze impacts of the project for businesses in the area. 36. Will a new storage and maintenance facility be needed? If a Bus Rapid Transit (BRT) project is the preferred alternative, the service would be supported with Metro’s existing bus maintenance facilities though they may need some modifications. If a Light Rail Transit (LRT) or Tram alternative becomes the preferred alternative, a new facility would be needed to store and maintain the rail/tram cars. This will be evaluated as a part of the environmental study. 37. Where would a rail storage and maintenance yard be located and how big would it be? The Draft EIS/EIR will identify possible locations for a rail storage and maintenance yard. It would need to be located within a ¼-mile of the route in an area zoned for industrial use, and approximately 20 acres in size. 38. How will a new transit system help the area economically? A new transit system has the ability to create new development opportunities along the corridor because it will provide increased regional connectivity, as well as increased travel options. It will also allow users to conveniently access retail centers along the East San Fernando Valley Transit Corridor, thereby stimulating increased sales revenues for local businesses. Opportunities for Transit Oriented Development (TOD) around stations can lead to providing service to residential and commercial projects, which in turn creates job opportunities. 39. Why is it important that I participate in this study? Community participation is a key component in planning any new transportation project. The environmental review process requires that public input and suggestions be considered. Your feedback will help us better understand the community’s transportation needs and priorities. Please make sure your voice is heard by attending one of our community meetings, joining the dialogue online, or sending us your comments by US Mail or e-mail. See Question 44 for more information on how to do that. 40. How will public input be reflected in the study? Public input is an important element of the planning process and has already influenced the study. Based on comments received at earlier stages, the project has evaluated different travel modes, routes and origin/destination points. Public input will continue to be one of the factors used to analyze the alternatives being evaluated for this project. All feedback received is summarized, documented and shared with the Metro Board of Directors. While public input is gathered throughout the study effort, there are two “formal” public comment periods. Scoping Meetings : The work on the Draft EIS/EIR began with a “scoping period” from March 1-May 6, 2013. During this time, the public was invited to provide input on the issues they suggested the study analyze. Public comments were received in person during Scoping meetings and in writing. Public Hearings: Prior to consideration and action by the Metro Board of Directors, the Draft EIS/EIR will be released for a 45-day public review period. This is the time when the public can submit “official” comments and questions for further consideration by the Metro Board and for additional analysis during development of the Final EIS/EIR. Comments and questions may be submitted in writing and at public hearings that will be scheduled during this time. It is anticipated that the Draft EIS/EIR will be available for public review in mid-2015. 41. What can I do to help spread the word? Join our mailing list by sending your contact information to eastsfvtransit@metro.net . 42. Can you make a presentation to my community group? We would be happy to schedule a presentation for your organization. Please contact us through any of the methods discussed in Question 44. 43. How can I contact you to ask a question, provide input or participate? There are many public participation opportunities throughout this process. 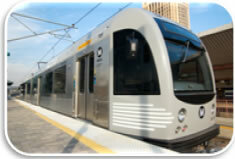 You can e-mail us at eastsfvtransit@metro.net to ask a question, provide input or send us your contact information. Please attend any meetings we host in the community at key milestones. We will let you know when those dates are if you send your contact information to eastsfvtransit@metro.net . Stay informed by following Metro on The Source and El Pasajero at metro.net .